This is the first in a series of posts about The Colored Teachers' Agency which was established to help African American teachers find employment. 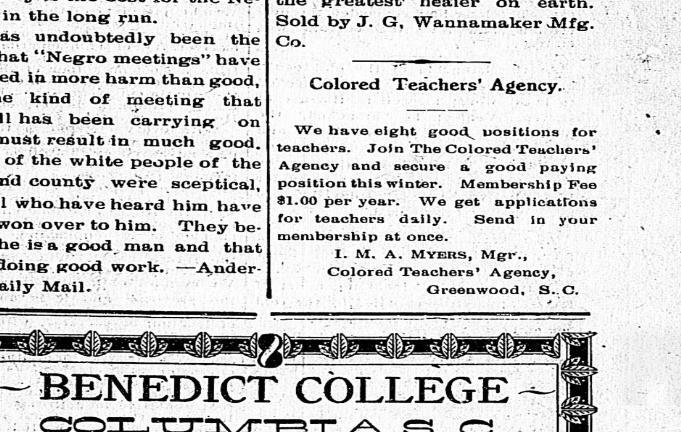 I first stumbled upon a reference to The Colored Teachers' Agency in an article in "The People's Recorder 1893-1925" on Chronicling America. I. M. A. Meyers was the manager of the agency in Greenwood, South Carolina. I have ancestors who were teachers, and I was fascinated to know there was a agency such as this charged with helping African American teachers find employment. They were required to pay a yearly membership fee and received help finding dues, as the ad says below on September 11, 1909. In this particular case, the agency had secured eight good paying jobs. As I widened my search, I discovered yet another reference to "The Colored Teacher's Agency" in "The Appeal (Saint Paul, Minn 1889-19??)" 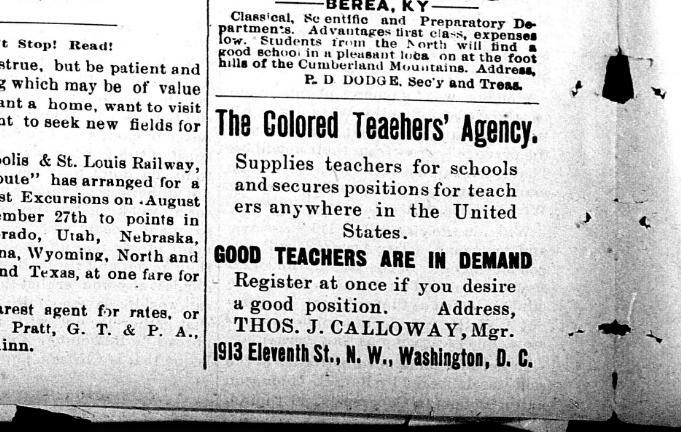 This ad had been placed in the paper by the Manager of the National Colored Teachers' Agency in Washington, D. C., Thomas J. Calloway. So I had by now concluded that various states had a chapter of this agency and probably fell under the umbrella of the national organization. Below, I will discuss a little bit more about the life of Thomas J. Calloway. 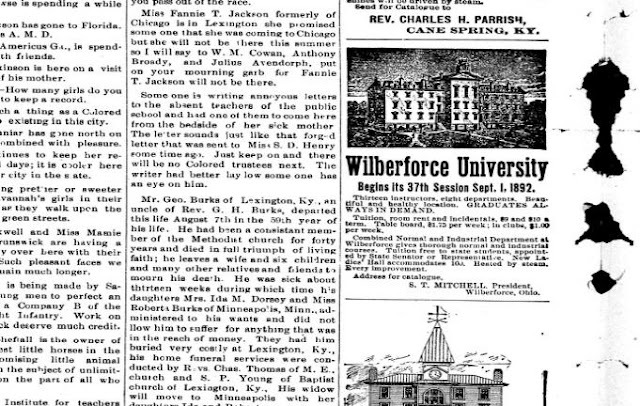 Just above the article on the bottom right corner of this page was an advertisement for Wilberforce University in Ohio. I was pleasantly surprised since this was a St. Paul, Minnesota paper. This is my mother's Alma Mater. I next embarked on an online search using Google to see if I could find more references to the agency. 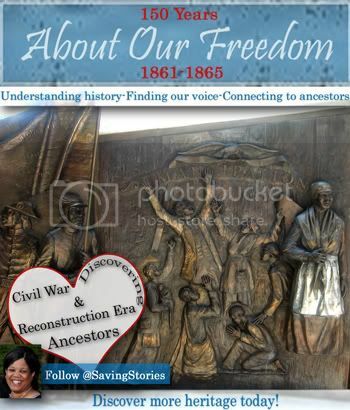 I found an ebook on the website, Hathi Trust Digital Library. I was overjoyed to discover that it is The Teacher's Handbook published by The Colored Teachers' Agency. 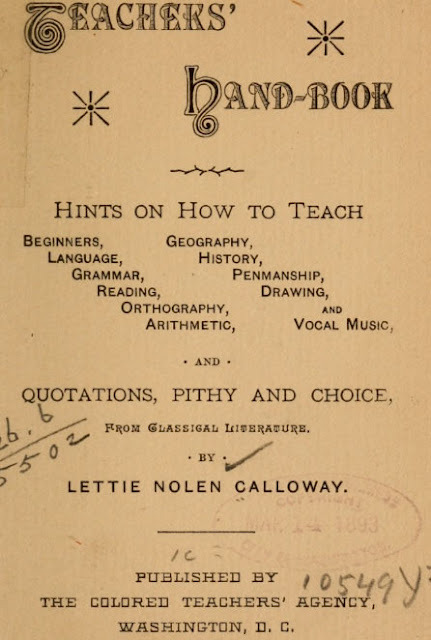 Calloway, Lettie Nolen. [from old catalog]. Teachers' Hand-book: Hints On How to Teach Beginners, Language, Grammar, Reading, Orthography, Arithmetic, Geography, History, Penmanship, Drawing, And Vocal Music, And Quotations, Pithy And Choice, From Classical Literature.Washington, D.C.: The Colored teachers' agency, 1893. "The enterprise is endorsed by Hon. Frederick Douglass who knows a good thing when he sees it--and the press generally. Mr Calloway is a reliable gentleman and when he undertakes anything he generally succeeds with it. He was at one time the Washington correspondent of the Plaindealer at Detroit, and contributed a series of readable articles on the public schools of the South. He is just the man for the work. Washington News Syndicate" (page 33, The Teachers' Handbook). By Shawn Michelle Smith, page 167.
: Prof. Thomas J. Calloway, A.B. : President Alcorn A. & M. college, West Side, Miss. : The college of life : or, Practical self-educator, a manual of self-improvement for the colored race forming an educational emancipator and a guide to success. 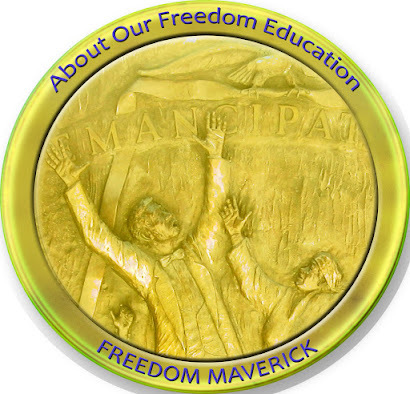 Giving examples and achievements of successful men and women of the race as an incentive and inspiration to the rising generation, including Afro-American progress illustrated. 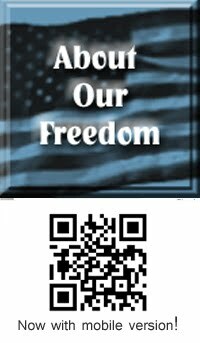 The whole embracing business, social, domestic, historical and religious education. / by Henry Davenport Northrop, Joseph R. Gay, and I. Garland Penn ; embellished with hundreds of superb engravings. 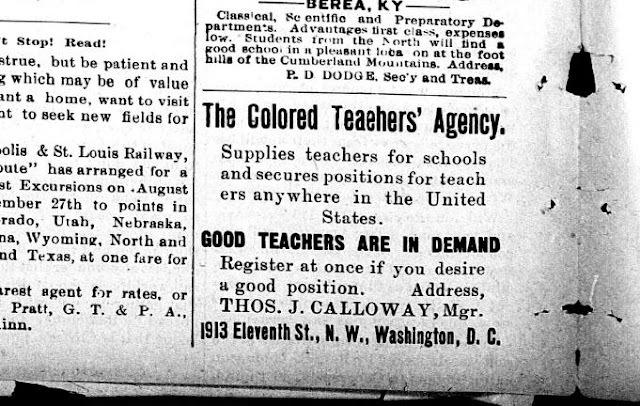 I cannot resist thinking about how The Colored Teacher's Agency seems to me like an earlier version of an employment agency. I have so many questions in my mind. I am curious to know when it was first created and if any records survive that would identify teachers or those who applied for membership. I am equally as anxious to read the handbook to see what I can glean. Thanks Robin for this fascinating post. You have peaked my curiosity on this subject. My Grandmother, Willa Leonard Hancock, graduated from Claflin college and was a teacher in Williston, SC before a series of events compelled her family to move to NY state in the early 1920's. All that I know is that she became a maid in Rochester. I wonder if the Colored Teachers Agency had any outreach in NY. I look forward to reading more on this! I, too, hail from a line of many teachers (and I'm one, myself). I'll be checking to see if any of my ancestors were members of this organization. I love that you found this! I also love your site and will bookmark it to read more thoroughly and often. On the topic of Lettie Nolen Calloway, I can help some (she was my great-great aunt.) She was Thomas J. Calloway's wife--they were married in 1892. Both were involved with the Tuskegee Institute and are mentioned from time to time in Booker T.'s writings.